Most instruction within CalStateTEACH's is facilitated by online curriculum and interaction with faculty advisers. The program's foundation is self-study with online materials, E-Texts, videos, web-based "class discussions," and on-site coaching. All participating teacher candidates are required to have access to a computer with online capability. Participants utilize a course website to access their curriculum materials, activity discussion rooms, important resource materials and technology support. They also interact with their assigned CSU faculty member by e-mail, videoconferencing, and face-to-face at their school site. They receive on-site support from a site mentor (Intern or Private School Option)or a cooperating and master teacher (Student Teaching Option). The program is divided into three terms, each containing 15 semester units coursework and clinical experience. Since there are no campus-based classes, the program is divided into four administrative regions. Candidates are assigned to centers based on the location of the school district in which they live or teach. Despite the reliance on technology, participants do not need to be technology wizards to succeed in the program. As long as they are comfortable with e-mail and accessing the Internet, they can easily adapt. The CalStateTEACH help desk provides assistance to participants and faculty. Faulty member Brian Van Dyke teaches via videoconference to teacher candidates participating as groups and individuals throughout the state. Each term teacher candidates participate in an iSeminar. Teacher candidates gather at satellite locations with other teacher candidates to learn about educational technologies and their connection with teaching. All satellite locations are connected by a Zoom videoconference. 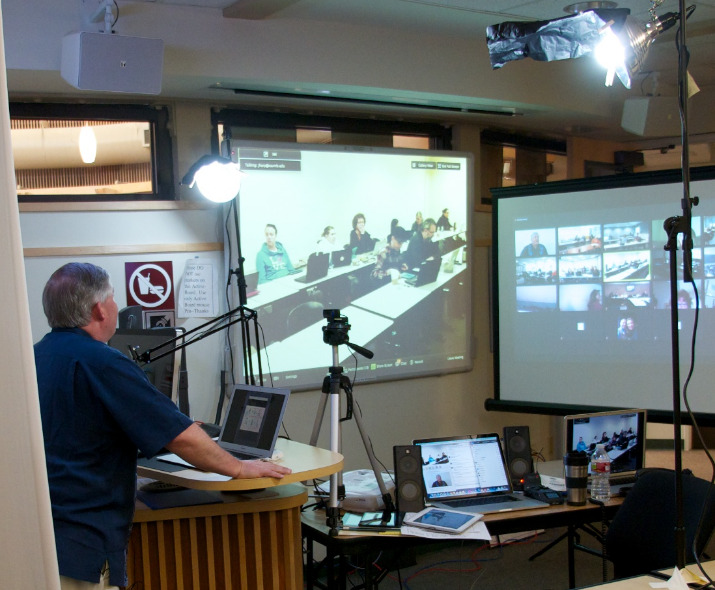 Individual teacher candidates who might otherwise need to travel an excessive distance are included in the videoconference individually. Anyone participating may appear in the videoconference or submit questions via a text system.